What Foods Have No Carbs? If you are trying to watch your weight, salad recipes are a great place to start. Weight loss is determined by the number of calories a person takes in versus the number of calories expended. For this reason, salads comprised of vegetables, fruits and low-fat additions are excellent low-calorie meal ideas for anyone trying to reduce calorie intake. Since plant foods are chock full of essential vitamins, minerals and phyto-nutrients, they can give you energy along with weight loss. Choosing salads is a great way to reach the recommended nine servings of fruits and vegetables a day. One cup of leafy greens equals one serving, one-half cup of chopped vegetables equals one servings and one medium-size piece of fruit or one-half cup of cut-up fruit equals one serving. Lean protein is a critical component of any salad for satisfying hunger and keeping you full for a sufficient length of time. Often, white chicken or turkey meat is the selection of choice. However, low-fat cheeses, including cottage cheese and feta, beans, such as kidney and chickpeas, hard-boiled eggs, preferably whites only, and tuna in water are satisfying selections. Unsaturated fats in the form of almonds, sunflower seeds or avocado will add to the satiety of your salad. Be careful to add these in moderate amounts, however, as they are calorie-dense. A little bit of these additions add a bounty of flavor and texture. 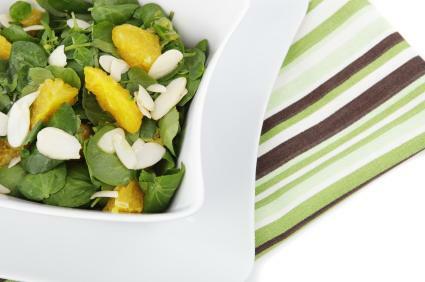 Adding a surprise ingredient, such as dried cranberries, apple slices or mandarin oranges, can spruce up your salad. By being creative, there can be a new salad for you to enjoy each day. Salad dressings can make or break the calorie totals of a salad. For instance, a popular creamy bottled bleu cheese dressing packs over one hundred calories per two tablespoons. Therefore, read labels closely for calories and fat grams. Choose low-fat versions of your favorite variety and use as sparingly as tolerated. You can make your own dressing without much effort. Simply combine one part vinegar, any variety you prefer, with one-quarter part olive, canola or grapeseed oil and herbs of your choice. The vinegar and herbs do not have calories and can be used as abundantly as you wish. There are many recipes for weight conscious dressings available. Below are two to get your started. Preheat oven to 300 degrees. Place bread cubes on baking sheet and bake for 15 minutes or until browned. Combine Parmesan cheese through garlic cloves in a small bowl. Mix well, using a whisk. Combine croutons, lettuce and dressing in a large bowl. Toss well to coat. One serving size equals two cups. 142 Calories, 2.4 g Fat, 2.6 g Fiber, 23 g Carbohydrate, 7 g Protein, 5 mg Cholesterol, 550 mg Sodium. Tip: Adding protein will make this salad a complete meal. Be sure to calculate points for any additional protein items. In small bowl or shaker, combine parsley through water and mix until thoroughly blended. Toast almonds by placing them in skillet over medium heat. Cook for 3-4 minutes or until slightly browned, stirring constantly. In large bowl, combine lettuce, celery and scallions. Add dressing and toss to coat. Top with almonds and oranges. Makes 4 servings.Per Serving: 106 Calories, 6 g Fat, 4 g Fiber, 13 g Carbohydrate, 3 g Protein, 0 mg Cholesterol, 165 mg Sodium. See tip above for adding more protein. Today's salads are far more than rabbit food. They can be as simple or as elaborate as you like. Salads can also range in flavor from all American to exotic. Try a variety of salads to keep boredom at bay while you watch your waistline shrink. How Do I Speed Up Ketosis? By Erin Coleman, R.D., L.D. Which Alcoholic Beverages Are Low in Carbohydrates?